Aware that they are still emerging and finding their sound as a band, Chapter and Verse are keen to make sure that they make a lasting memory. Saturday evening at The Borderline, in Soho, was no exception. 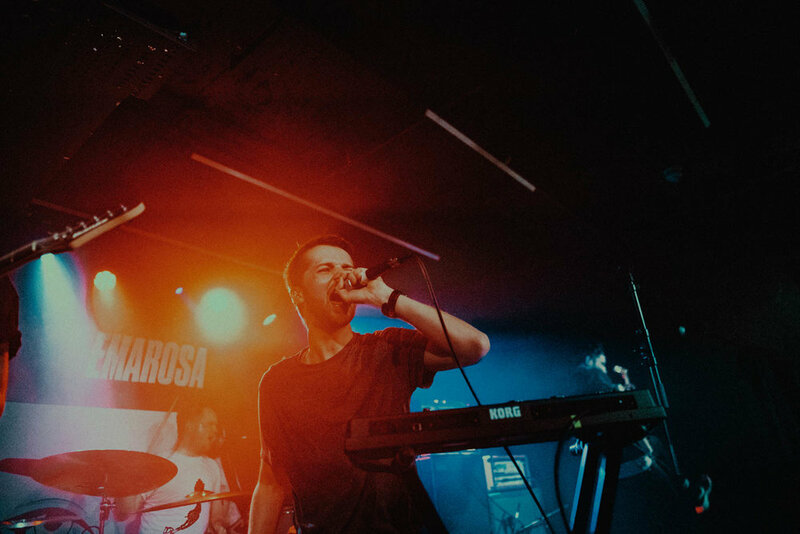 A homecoming gig of sorts, after touring the UK in support of America’s Emarosa, Chapter and Verse thundered onto the stage and their energy did not falter, one bit. Opening up with the atmospheric and emotionally charged ‘The Casket’ which is taken from their upcoming second EP, Chapter and Verse played a set that was full of their most energetic songs, taken up a notch for the live performance. For those familiar with one of their earlier releases, ‘Shelf Life’, one of the most prominent lyrics starts with: “I’ve been selling out my friends for lifetimes.” Throughout the band’s set this becomes a recurring refrain, transformed into a melodic-synth interlude to connect a few of the songs. What strikes me throughout the entire night is how complimentary each of the bands are, of each other. Before introducing ‘Eleven Hours in Real Time’, frontman Josh takes the time to reiterate how good the night ahead will be and that it will definitely be worth sticking out. I believe that most people would’ve been thankful for turning up early enough to check out Chapter and Verse, as ‘Eleven Hours in Real Time’ was an outstanding performance. The switches between time signatures and the combination of Darren’s whimsical, weaving, guitar riffs and Ash’s thrashing drums towards the end of the song, were intoxicating. Their latest single, ‘Ink’ started off with an acoustic intro and grew in intensity; it was incredibly emotive, and Jonny’s bass lines lulled you into an almost hypnotic state. Nearing the end of the set, with a heavy-metal style breakdown, Chapter and Verse went into ‘The New Breed’, which is also the name of a mindset they talk about in their music. Josh’s vocals switched back and forth from soulful singing to anguished screams with the addition of a change in lyrics that saw him test the volume of the crowd and susequently unplug from the microphone to scream “I don’t feel in control of myself when the claws are deep in my heart.” Chapter and Verse fully solidified themselves as a band that is not stuck in their ways: they find pleasure in experimenting with parts of their songs, and doing the best they can to elevate their live performance. With the voracity in which they performed, I hope we get to see Chapter and Verse on a headline tour of their own, pretty soon.